Notre Dame Baseball players Ethan Hager and Elias Gordon have both signed to play baseball at the college level. 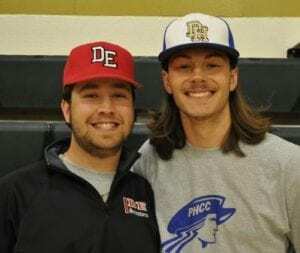 Hager will play at Davis & Elkins College while Gordon will continue at Patrick Henry Community College in Martinsville, VA. Both boys are part of a Notre Dame Baseball team that, at the time of writing, is 7-4 on the season.